Characterized by its impressive reach, the PowerShot SX70 HS from Canon is a flexible point-and-shoot offering high-resolution imaging and a wide-ranging 65x zoom lens. The 20.3MP CMOS sensor pairs with the DIGIC 8 image processor to afford stills shooting at up to 10 fps for working with moving subjects, and also enables recording UHD 4K video content as well as producing 4K time-lapse movies. For working in a variety of shooting situations, the 65x optical zoom covers a wide-angle to super-telephoto focal length range, and is complemented by five stop-effective image stabilization to minimize the appearance of camera shake for sharper handheld shooting. Benefitting the imaging capabilities, this camera also incorporates a 2.36m-dot OLED electronic viewfinder for clear eye-level shooting and built-in Wi-Fi and Bluetooth permit seamless wireless control and sharing capabilities. A 20.3MP CMOS sensor pairs with the DIGIC 8 image processor to realize notable image quality and speed to permit stills shooting at up to 10 fps, UHD 4K video recording, and in-camera 4K time-lapse movie creation. Together, the sensor and processor also produce clean image quality and enhanced sensitivity with minimal noise for working in difficult lighting conditions. An expansive 65x optical zoom lens offers a wide-angle to super telephoto 21-1365mm equivalent focal length range to suit working with a wide variety of subjects. This extensive reach is complemented by a versatile image stabilization system that minimizes the appearance of camera shake by up to five stops. A 2.36m-dot OLED electronic viewfinder is available as a clear and bright means for eye-level monitoring. Built-in Wi-Fi allows you to wirelessly share your photos and movies with a linked smartphone or tablet as well as remotely control the camera from the mobile device by using the Camera Connect app. Mobile devices can also connect to the camera using Bluetooth for remotely adjusting settings and gaining a live view image from your smartphone or tablet. Bluetooth connectivity also allows you to use your smartphone's location data to geotag your photos, and the date can also be stamped on your imagery for easy reference. Box Dimensions (LxWxH) 7.5 x 5.7 x 5.4"
PowerShot SX70 HS Digital Camera is rated 4.3 out of 5 by 8. Rated 5 out of 5 by Todd from Winning camera I purchased this camera to replace two others: a Nikon P900 and Panasonic LUMIX Fz300. The Canon surpasses both. It’s lighter weight and focuses quicker and more accurately than the P900. It doesn’t have the 83x zoom like the Nikon P900 but it’s 65x zoom is completely adequate. The EVF is crystal clear and I use it more than any LCD screen articulating or not. I photograph birds mostly and it focuses very quickly and the sports mode shoots at 10 fps which is great for birds in flight. If you’re looking for the latest technology in superzoom bridge cameras this is it. After having used the Nikon P900 for two years, I’m glad I made this switch. Rated 5 out of 5 by Jeri from Excellent camera I upgraded to this new model from an old Lumix and I cant say enough about it for what I use it for. First of all, it will never be a high end body and a professional lens. But thats not what I purchased it for. I love taking photos of birds for my own ID and enjoyment and I am very satifisfied with the clarity this camera gives me for the price. I went on an outing to a wildlife refuge with photographers who were carrying their big, expensive lenses. We compared shots. In good light you couldnt tell mine from theirs. But the main difference is in the cameras softness in less than adequate light. Im okay with that compromise. When I go out walking I carry this camera on a harness around my neck, my binoculars and also carry a scope on a tripod. I hardly know the camera is around my neck its so light. I think it produces terrific quality for a terrific price. Ive attached an image of White Tailed Kite talons taken from a distance. Rated 5 out of 5 by Tamika from Great camera! Love it! I have owned many generations of this camera and this one does not disappoint. It is a little larger in size that my last sx50 but not much. Love the zoom and increased shutter speed. Photos are sharp and very clear. The grip on the camera is a nice improvement as well. I am very happy with this purchase. It’s a great midsize camera. Rated 5 out of 5 by Jeri from Fantastic camera! I love this camera! My objective is to take candid photos of birds or wildlife for my own enjoyment (and as a birder, education). Im not after magazine quality photos but still, the quality is exceptional for a bridge camera. Its extremely lightweight so wearing it on a harness along with my binoculars doesnt weigh me down. I also carry a scope on a carbon fiber tripod when I walk the camera is so lightweight I dont even feel it around my neck. Its so easy to dial in the settings, set up wifi transfer, etc. The cameras sensor is excellent and when I download to Photoshop (jpg, not raw) there is usually no correction needed. The downside - and this is where Im willing to compromise - the sensor is small and therefore produces soft images in very limited light. But I can live with that because I use this when I bird and unless Im out at dusk trying to spot owls the low light limitation is not an issue. Im attaching a picture I took of a White Tailed Kites talons from quite a distance away. Rated 3 out of 5 by Lynn from Not good enough, returned Bought to take pics of birds at feeder. Wanted something between my dslr and iPhone. Wanted to be able to easily get to iPhone, iPad, because that’s how I show/share photos usually now. I don’t think instructions even for this model so bad. Did get it to talk to iPhone by d/l app and following instructions there, and it was very easy to do once did that. Very hard to get to focus even on non moving image. Image quality ok if looking at on iPhone, but on iPad not good enough. No way it would focus on eagle in flight. Bird sitting 15 feet away was a challenge to shoot, zoomed in really close but couldn’t get to focus on it consistently. Was shooting through closed patio door on cloudy day. So light weight it feels cheap. Tried to u/l photos for this review and couldn’t do, sorry. I tried with old dslr and it had no problem. I returned and bought another Sony dslr body that talks to iPhone. Was enticed to try because of huge zoom. If you just want to view on iPhone would be ok. If you aren’t used to dslr images might be good enough for you. Rated 3 out of 5 by Patricia from Disappointing I originally bought this camera to take pictures of distant birds, because of the extreme optical zoom, and its light weight. It does not capture any detail in white areas such as white birds or clouds. It has proven wholly inadequate for this purpose. For landscapes, the colors are vibrant, which I like, but the sky color has a definite greenish tinge to it, which is not accurate. Its a pretty color, but if I want pretty colors, I will do that myself. I dont expect my camera to change the colors. For macro shots, forget it! It is difficult to hand-hold this camera and get the composition I want. The view finder is electronic, which is not acceptable. I want to see through the lens directly. When you take a picture, it freezes the captured image momentarily, cutting off your view. This means rapid shooting is not possible. I was able to exert little to no control over what the camera chose to focus on. I think the jpeg compression is greater than it should be. Looking at an image 1:1, NOTHING is in clear focus at any distance, and there are no details. Everything is heavily pixilated. All of this at an ISO of only 100, and I am getting comparable results with an ISO of 3200 on my Pentax K-3! I took comparison pictures with my Pentax, and although the image is only 25% larger, the file sizes are 50-75% larger. I put it on aperture priority so I could stop it down to get better depth of field, only to discover I cant stop it down more than f/8. Not acceptable. I can stop my Pentax down to f/22 or even f/29 with certain lenses. I dont see a reason to limit the camera so severely. There are features I have yet to explore since I just acquired the camera, but it is clear it will not serve the purpose for which I bought it. Owners whom I met in the field like it, but perhaps that is for lack of experience. For the price, Canon can and should do much better. All things considered, this camera would be priced about right at $150-200, not over $500. How many shots can you take on one charge?? You should get around 250-300 shots with a fully charged battery. What size sensor does it have ? 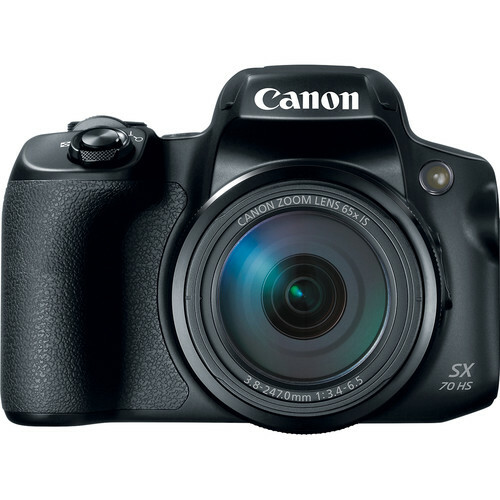 The Canon PowerShot SX70 HS Digital Camera has a 20-megapixel back-side illuminated CMOS sensor which has a sensor size of 1/2.3&quot; (6.17 x 4.55 mm). Can you flip the screen left, rotate it and close it with the screen side IN to protect it when not in use? Is the ISO limited to 100 for exposure over 1s? What is the video recording time in 1080 HD and the time in 4K? There is no built in GPS, but the camera can connect to your mobile phone via Bluetooth or WiFi and automatically get gps coordinates that way. Does this camera have a DSLR-style hotshoe for mounting on-camera audio like a RODE videomic, and can it be mounted to a typical ball-head tripod/gorillapod mount? The SX70 does have a mike input jack, but you'll have to add your own shoe to mount a mike or get a mike bracket that attaches to the tripod jack. Does this camera shoot in raw? YES, you can shoot in RAW and in a newer format called CRAW according to the official 289 page SX70 Canon Manual.